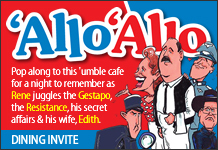 ‘Allo ‘Allo Dining Invitation is an interactive comedy dinner show where the audience dine in Rene and Edith’s ‘umble cafe. It begins in the bar over pre-dinner drinks, where the audience are greeted by the characters. Then, when the time comes, the audience are invited through into the restaurant where they are served a three course meal. The show is half-scripted and half-improvised by the actors, taking place around the audience whilst they eat. It references all the most famous bits from the original show whilst having a narrative all of its own. Poor old Rene, as if things weren’t bad enough. The Germans already have him hiding the painting of the fallen Madonna with the big boobies by Van Clump. Michelle of the Resistance still needs his help to get the British airman back to England. And, worst of all, Edith, his wife, still thinks she can sing!